This e-book offers three similar effects all based on a singular premise. 1. 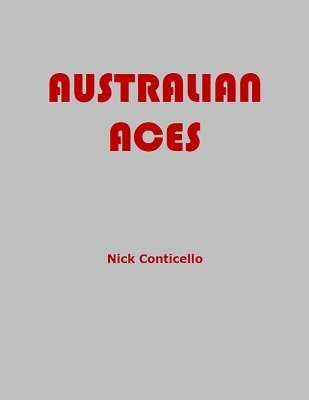 Australian Aces: The performer casually shuffles a pack of cards, then hands it to a volunteer. The performer need not touch the cards for the duration of this feat. The volunteer cuts off roughly a quarter of the pack. The volunteer names any Ace freely. He spells its name and gives the packet an Australian Shuffle. The last card he holds is the Ace he named! The volunteer now spells the word 'Ace' and the Ace matching the color of the named Ace turns up. Finally the volunteer spells the suit of the named Ace and tables the remaining cards alongside the spelled cards. The top cards of each packet are the remaining Aces! 2. Hands-On Australian Aces: There are a few contingencies requiring some memory work to produce the above effect. This version, with the performer handling the cards, has less to remember and plays much faster. 3. An Australian Transformation: A visual elaboration of the basic effect. The performer displays twelve court cards, then produces an Ace named by the spectator, followed by the other three as above. No gaffs, but a few standard false counts (not taught) are employed. This version is best presented as a packet trick. All three versions are based on an idea explained in Potpourri 3 . A simple stack is required, but a handling in which the pack can be shuffled by the audience is taught. Versions 1 and 2 are sleightless.